Scott Brown 2016? Been there, done that. Updated. Former Massachusetts Sen. Scott Brown said he is considering a run for president in 2016, saying his party would benefit from his moderate Republican views. “I want to get an indication of whether there’s even an interest, in Massachusetts and throughout the country, if there’s room for a bipartisan problem solver,” Brown told the Boston Herald by phone Sunday while attending the Iowa State Fair. The former senator, who lost his re-election bid last year to Elizabeth Warren by more than 7 percentage points, said he isn’t close to making a decision. Oh, come on. Who would ever be dumb enough to vote for an upstart state senator who served just a few short years in the federal Senate before running for president? The predictions and fears of the Affordable Care Act’s adversaries have begun to materialize, specifically fears that the law will encourage employers to demote their employees to part-time positions in order to evade federal health care requirements. Popular clothing company Forever 21 is the first of what might be many companies to limit its non-management workers’ hours to 29.5 a week, just below the 30-hour minimum that the ACA deems full-time work. Explaining that the company “recently audited its staffing levels, staffing needs, and payroll in conjunction with reviewing its overall operating budget,” Associate Director of Human Resources Carla Macias informed employees that effective August 31, they will no longer be full-time employees of Forever 21. It is a move that will likely harm the reputation of the company, will absolutely harm the economic circumstances of its employees, and will function as a tangible example of the Affordable Care Act’s consequences and shortcomings. Although the ethical nature of Forever 21’s decision is debatable, it is both rational and understandable. A company that boasts regularly low prices and frequent, sensational sales, Forever 21’s competitive success is largely dependent upon its ability to maintain low manufacturing and operational costs. The ACA is an undeniable burden on this principle, and Forever 21’s management has the prerogative to take any legal measures necessary to avoid raising the costs of its products. Adapt by controlling expenses, in this case by reducing employee hours to avoid the employer mandate’s tripwire. In the end, they still probably harm their business, assuming a higher instance of unhappy employees, but it’s the least harmful option that also meets management’s primary responsibility — to create a profitable business for the owners. It is, in fact, the unquestionably ethical choice. As I’ve said before, I feel sorry for anyone seeing their hours cut, but don’t blame the company, which is simply making a rational choice. Instead, lay the blame directly where it belongs, with the Democrats who voted for it and their Leftist and Big Business enablers who shoved this anti-constitutional monstrosity down our throats, thus creating the perverse incentives that lead to Forever 21’s decision. And, to the extent that any of you seeing your hours cut voted for Barack Obama and the (Social) Democrats, blame yourselves, too. Elections, as they say, have consequences. (1) And maybe their other costs, too, as their suppliers will likely have to meet Obamacare’s mandates and thus pass the costs along in the form of price increases. Yet another of the “inconvenient truths” that send Warmists into a frenzy. 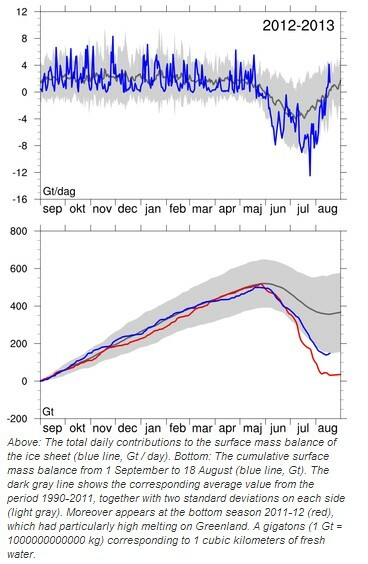 The red line in the second graph shows the record melt season of 2012, which alarmists got hysterical about. Note that at the end of the summer of 2012, there was slightly more ice than a year earlier. During a normal Greenland meltdown year, the ice sheet gains almost 400 gigatons of ice. You are currently browsing the Public Secrets blog archives for the day Monday, August 19th, 2013.